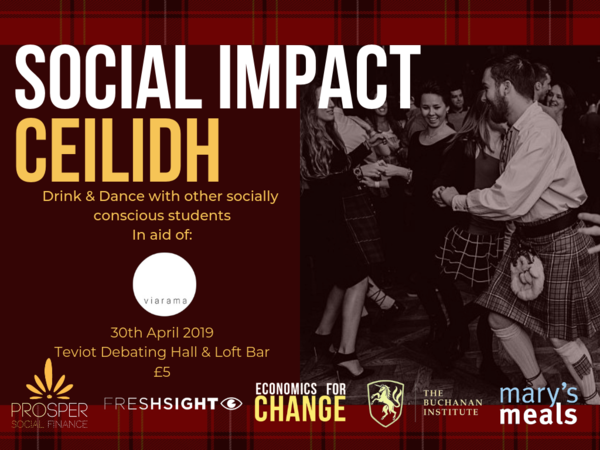 After the success of our collaboration on the Rethinking Capitalism summit in January, we decided to host a Ceilidh for socially-impactful students to dance for a cause. Viarama is a virtual reality social enterprise that uses its technology to give people incredible experiences that they would not otherwise be able to have, such as for people in hospice. in February, Viarama suffered a break-in, and all of their VR equipment was stolen, as well as all of their administrative technology. In order to get Viarama's incredible social impact up and running, we will be donating all ticket contributions to the social enterprise.